spark scalability: what am I doing wrong? The number of different IDs is less than 10k. Each ID is a smallish int. The job fails because too many executors fail with OOM. When the job succeeds (on small inputs), "myoutput" is about 100k. I tried replacing saveAsTextFile with collect (because I actually want to do some slicing and dicing in python before saving), there was no difference in behavior, same failure. is this to be expected? I used to have reduce(lambda x,y: x.union(y), [sqc.parquetFile(...)...]) instead of sc.union - which is better? Does it make any difference? The cluster has 25 nodes with 825GB RAM and 224 cores among them. Invocation is spark-submit --master yarn --num-executors 50 --executor-memory 5G. A single RDD has ~140 columns and covers one hour of data, so a week is a union of 168(=7*24) RDDs. Spark very often suffers from Out-Of-Memory errors when scaling. In these cases, fine tuning should be done by the programmer. Or recheck your code, to make sure that you don't do anything that is way too much, such as collecting all the bigdata in the driver, which is very likely to exceed the memoryOverhead limit, no matter how big you set it. To understand what is happening you should realize when yarn decides to kill a container for exceeding memory limits. That will happen when the container goes beyond the memoryOverhead limit. Container killed by YARN for exceeding memory limits. 16.9 GB of 16 GB physical memory used. Consider boosting spark.yarn.executor.memoryOverhead. The first thing to do is to increase the memoryOverhead. In the driver or in the executors? When you are overviewing your cluster from the UI, you can click on the Attempt ID and check the Diagnostics Info which should mention the ID of the container that was killed. If it is the same as with your AM Container, then it's the driver, else the executor(s). That didn't resolve the issue, now what? You have to fine tune the number of cores and the heap memory you are providing. You see pyspark will do most of the work in off-heap memory, so you want not to give too much space for the heap, since that would be wasted. You don't want to give too less, because the Garbage Collector will have issues then. Recall that these are JVMs. As described here, a worker can host multiple executors, thus the number of cores used affects how much memory every executor has, so decreasing the #cores might help. I have it written in memoryOverhead issue in Spark and Spark – Container exited with a non-zero exit code 143 in more detail, mostly that I won't forget! Another option, that I haven't tried would be spark.default.parallelism or/and spark.storage.memoryFraction, which based on my experience, didn't help. where "my_properties" is something like the attributes I list above. Not the answer you're looking for? Browse other questions tagged apache-spark bigdata pyspark scalability distributed-computing or ask your own question. 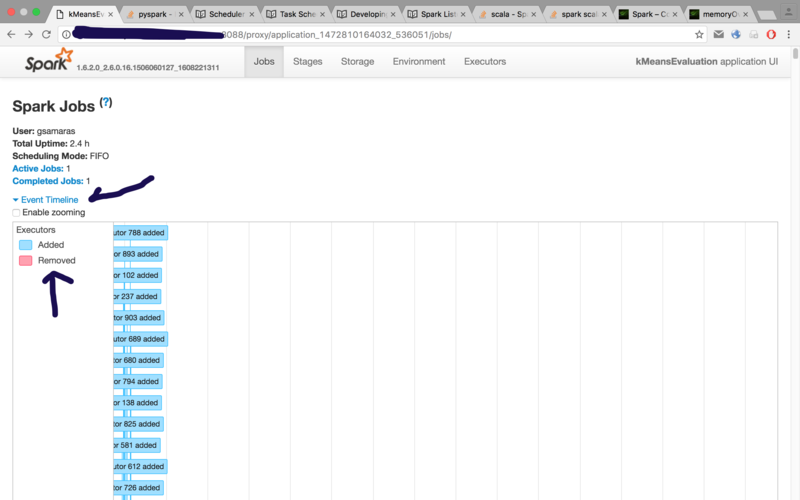 What are workers, executors, cores in Spark Standalone cluster? How does spark copy data between cassandra tables?